Is the Rowing Machine One of the Best All Round Workouts? There’s nothing so much fun as messing about in boats – or so Mr Toad says. This is definitely true of rowing, a traditional British sport and an excellent way to keep fit. Rowing is also a great gym workout, so let’s have a look at those rowing machines. 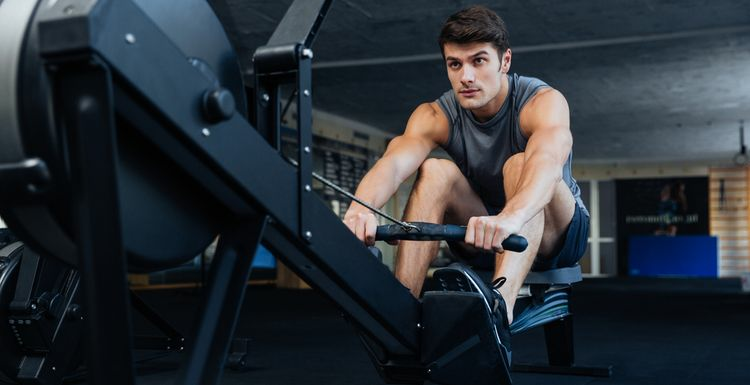 WHAT ARE THE FITNESS BENEFITS OF A ROWING MACHINE? The action of rowing uses legs, back and arms. Using all those muscles means using a lot of calories; an hour on a rowing machine can dispose of between 600 and 1200 calories depending on your fitness level. Like ‘real’ rowing, the machine supports you and there is no impact on your joints. Most gyms will feature at least one rowing machine among their cardio equipment, so you won’t need to travel far. Gym machines generally use either air or magnets to simulate the resistance of water. Air machines are more realistic, while magnetic ones are quieter – choose according to your preference. WHAT DO I NEED FOR A ROWING WORKOUT? Form-fitting clothing is best, so that it doesn’t catch in the machine. You also need to wear trainers. The machine must be set for resistance, pace and mode; as they are all different, ask a member of the staff for help. Rowing machines are very safe, but as always you need to use them correctly to avoid injury. Here are some illustrations of correct ‘form’ to ensure that you don’t strain your back. Rowing is split into ‘drive’ and ‘recovery’ and both need to be done correctly. Stand up, do 10 lunges, stretch gently for 1 minute. Five minute cool down: repeat warm up moves, gradually slowing. End with static stretches. Need more? Try this combo rowing and dumb-bell workout. For fitness, you need to push yourself to higher intensities, making those muscles work just a little bit more each time. You can increase strokes per minute (SPM) or times as you get fitter. Try this ‘pyramid’ workout. Row 2 minutes at 22 SPM, 1 minute rest. Row 3 minutes at 20 SPM, 1 minute rest. Repeat twice. Row 5 minutes at a low rate. Want to know more? Take a look at this great guide, packed with practical tips and advice on rowing training. Want to get more involved? British Rowing is the organisation to check out, and they have plenty of advice for your indoor training session. Rowing machines are seen as a bit old-school - which is great for me as there's never a queue for it. As the article says, it has many benefits without risking joints. Gets a bit dull but does the trick for exercise.